Emergence is an interesting thing; one might even argue that it is the most naturally occurring of all things – couldn’t we say that the universe itself just emerged and keeps emerging? As we approach the limits of the best laid out planning processes we could come up with we begin to face the fact that a world of increasing complexity cannot be managed like it is a big machine that will produce predictable and measurable outcomes. In this increasingly complex world some of us are seeking ways to align ourselves with the process of emergence, to foster and facilitate it, to serve it with sharp intentionality and to let go of command and control fantasies. Here is where “The Hub” comes in. I had the pleasure of visiting “The Hub” in São Paulo and I find myself deeply inspired. Emergence Theory demands locality, it proposes that local micro-interactions are foundational to the emergence of new systems. “The Hub” is about co-location, it provides a physical space that is meant to “facilitate unlikely encounters” among people concerned with social change and social innovation. “The Hub – São Paulo” provides a beautiful creative space that is open, flexible and stimulating. Small teams or individual social entrepreneurs can make it their full-time home, or they can arrange to rent space there anywhere from 5 to 100 hours per month. These social innovators may be focused on anything, and ideally on different things. In fact, given that the “The Hub – São Paulo” is still in start-up mode, I have learned that some of its tenants do not even have an explicit social mission. A space like this, without walls or fixed desks is a space where previously unthinkable projects can emerge, it is an ideal space for the intersection of fields that makes “The Medici Effect” possible – this is how innovation happens. Hub Hosts are a lot like network weavers. Yes, they take care of details like shared printers and internet connections, but they also work to interconnect tenants using the space. Tenants are encouraged to host events and information sessions where they can share what they are working on and what they are learning. “The Hub” is a truly vibrant space where socially committed individuals can experience life in a network and begin to shed their organizational constraints. “The Hub” is just one response to the need for new forms of human organization, but it certainly is a great one, it is the sort of place from which a new world can emerge. What other efforts to apply network theory do you know about? So I’m not Galileo, but there is something very powerful about the use of images in seeking a common language to work with complexity. 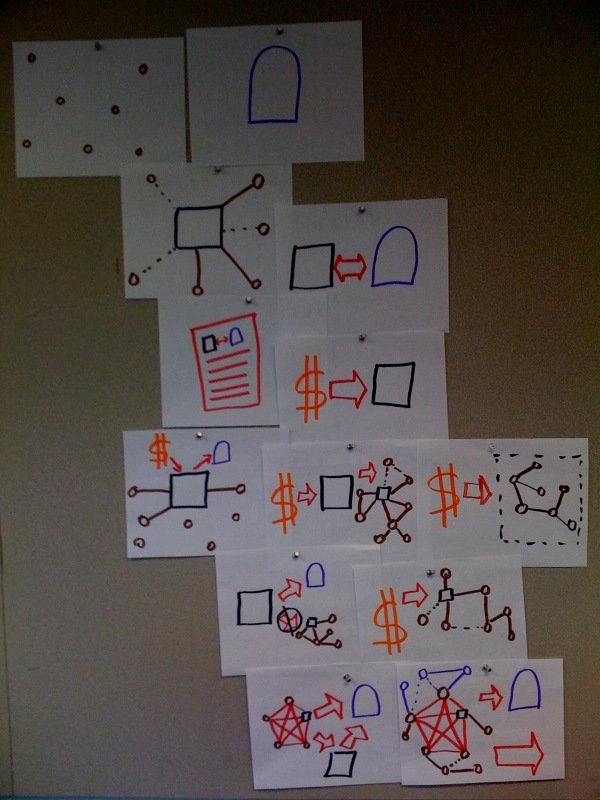 Check out the set of drawings we used in a recent learning meeting. We are trying to understand the relationship between advocacy coalitions, local groups, the State, and investing in Network Building capacity. Can you put the story together? I’m intrigued by the idea of living systems and so I spend a lot of time thinking about what it is that gives a network a life of its own. If I’m convinced of the need of decentralized structures and in the power of self-organization then I have to concern myself with what it is that motivates networked efforts to take on a life of their own. When I look at my own experience of life in a network I understand that learning is a key motivator for decentralized self-organization. To be specific: I want to learn the best way to apply the logic of decentralized structures to movement building efforts. In order to do this: I read, I experiment, I share my learning, I become engaged in relationships with others who want to learn the same thing. People who are engaged in a quest for something that they are passionate about come together of their own volition. I am part of a network of friends who are people interested in movement building and social transformation, we come together to socialize as well as to problem solve and learn together. In order to keep this network alive we most often have to overcome obstacles like being too busy working in some social change nonprofit! So my own experience of life in a network demonstrates that the desire to learn about something that you are passionate about is great fuel for decentralized self-organization. But there is one more layer of nuance here. Among my group of friends we are not doing the kind of learning that is defined by some specific quantity of knowledge being transferred from one head to another, we are engage in the type of active learning that informs creative action. So there is learning, but there is also something about creative power. But that’s a topic for another blog. I’m trying to negotiate the relationship between simplicity and complexity, and I find this video a perfect example of what can happen when this negotiation is successful. The subprime crisis has been sold to us as the byproduct of a highly complex financial system, but it wasn’t just that, was it? We also know that it had something to do with what turned out to be high-stakes gambling sold to us as banking, but it wasn’t just that either, or was it? This piece gets us closer to the answer, and I wonder what we can do to bring such capable storytelling and visual imagery to the work of social change and the development of more skilled organizations. It’s only 2.5 minutes, check it out!